One important way many Americans stay informed about politics, including the 2016 elections, is through conversations with others. About seven-in-ten U.S. adults talk with others about politics at least a few times a month, according to a 2014 survey by the Pew Research Center. But a new analysis of survey data finds that whom they talk with most often about the subject varies a great deal between men and women. Those who talk about politics at least a few times a month were asked to identify the three people with whom they discuss this topic the most, and to describe their relationship to these people. It turns out that women are more likely than men to say their conversations about politics are most often with a parent or child, while men are more likely than women to rely on people outside the family. As might be expected, younger adults are more likely than older people to say they talk politics with their parents, while older adults are more likely than young adults to name their children. But within age groups, there are sharp differences between men and women. Young women were far more likely than young men to say they most often talk about politics with a parent: 62% of 18- to 29-year-old women who have at least one political discussion partner named a parent, compared with 42% of men the same age, a 20-percentage-point difference. A gap remains among 30- to 49-year-olds, then tapers off among those 50 and older. Women of older age groups are also more likely to name a child as a conversation partner. Among women ages 65 and older, 44% say that one of their children is someone they most often speak to about politics, much higher than the 26% of men in the same age group. A gap persists for those ages 50-64 and ages 30-49. 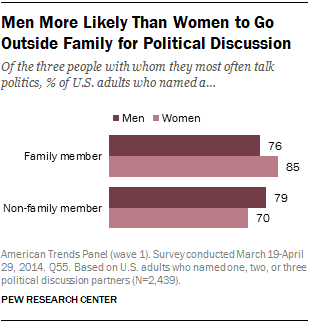 Overall, women are more likely to name a family member (including other family members, such as siblings) as one of the three people they talk with most about politics (85%, vs. 76% of men). On the other hand, men are more likely to name non-family members (79%, vs. 70% of women), a difference that holds true across all age groups. For example, young men ages 18-29 are far more likely than their female counterparts to think of one of their friends as a main discussion partner (72% vs. 58%). In addition to having differences in whom they turn to for political conversation, men and women differ more generally in their overall interest in discussing politics. Men tend to talk about politics more often than women and are more likely to say they enjoy it. About three-in-four men (77%) say they discuss politics at least a few times a month, compared with six-in-ten women. Fully 63% of men say they enjoy talking about politics some or a lot, compared with 45% of women. But when it comes to those who do talk politics, men and women often have different discussion networks.